Removes cutback, multi-purpose adhesives and other hard-to-remove floor residue quickly and easily. 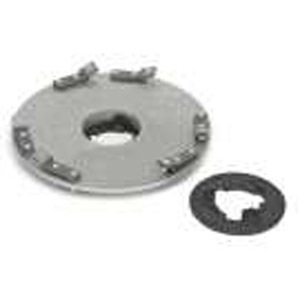 The EZ Scrape consists of six carbide blades (3 more than previously) spring mounted on an aluminum casting which fits 175 RPM rotary disk floor machines. There are three different models to accommodate different diameter machines. No messy chemicals or disposal problems. The EZ Scrape is a dry removal system. The rotating steel blades reduce floor accumulations (even painted lines) to dry, sweepable dust. There is no chemical waste to dispose of. No "downtime" waiting for the floor to dry. After sweeping away the residue, you're ready to start installing the new floor.